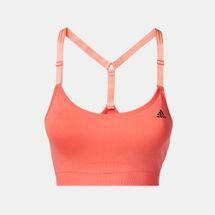 The adidas Seamless Bra has a wide band and a reinforced design for support. Made from climalite® fabric to wick moisture to keep you dry, the bra comes with a ventilating mesh panel to keep you cool and carefree. The adjustable straps can be worn three ways.